Building supercars, especially Ferraris, is a mixed blessing: Sometimes you know exactly what pieces you need and how they’ll all work together, but just one wrongly placed pin or tile can ruin the model’s proportions and send it to the dustbin. However, when every single piece takes its rightful place, an outstanding scale model is born — just like this beautiful Ferrari Testarossa by Jeroen Ottens. This is the case when a creation does not need any description; it is just too lovely to simply list all of its parts. 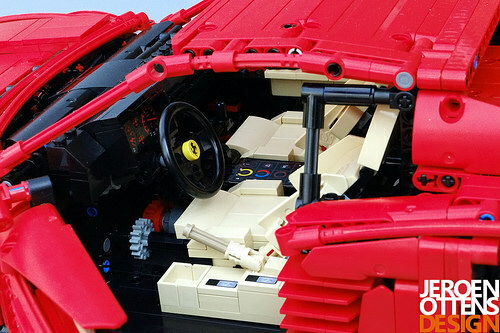 And when you finish enjoying this LEGO Testarossa’s iconic exterior, peek inside at its very detailed interior, which even has a working glovebox!